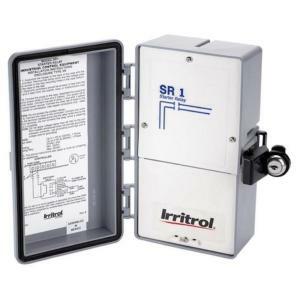 The Irritrol SR-1 Pump Start Relay is designed to start a pump to supply water pressure and flow to an irrigation system or for switching to control landscape lighting transformers. It is the perfect add-on to the Toro Evolution AG series Controllers. It is also used with irrigation pumps when the Irrigation Clock Control calls for an "on cycle" the pump start relay converts the 24VAC low voltage from your controller to energize the pump with 120VAC or 240VAC line voltage. The SR-1 pump start relay comes enclosed in a weather resistant case for outdoor protection.